With the complete removal of steam traction from British Railways in August 1968 the sight some eight years later of a working steam depot stacked with over a 100 locos on a Sunday afternoon was comparable to turning back the clock some ten or more years. Line after line of locos were being prepared for work on Monday morning with fires being lit, motion oiled and tenders replenished with coal. Photo - Four 15Fs in a line up on Bloemfontein loco shed. One has a water cart suggesting it is booked to work a remote siding without watering facilities. 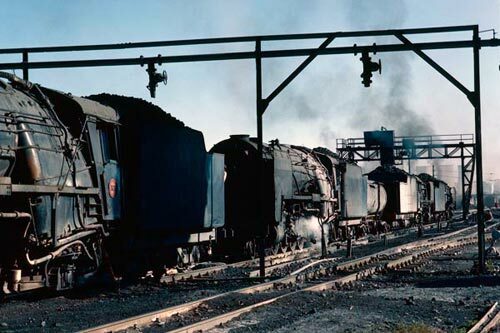 In 1976 South African Railways still had a considerable fleet of locos with many lines still 100% steam. Constructed to Cape Gauge (3 feet 6 inches) the locos were still comparable in size to their British counterparts many exhibiting design features that were commonplace at home. However there were differences with bar frames rather than plate frames commonplace with more modern locos having cast steel frames. Lightly laid track also meant that eight-coupled locos were the norm so that axle-loads could be reduced. Some areas suffered from water shortages so tenders were generally larger and some locos even had auxiliary bogie tanks to ensure boilers didn't run dry. Poorer quality coal also meant that grates were much larger with fire raking normal practice to stop a layer of clinker killing the fire. Bloemfontein lies in Orange Free State which is a predominantly Afrikaans speaking area. Brief formalities in the office checking the permit were soon completed and I was set loose to explore the shed without a guide. After taking in the sight of so many locos roughly half of which were in steam was followed by a more diligent tour of the premises walking up and down every line of locos. On shed were active representatives of class 15F (4-8-2), 19D (4-8-2), 24 (2-8-4) and 25NC (4-8-4) with a small dump containing some redundant 15E and 19Ds. One surprise was the generally high external condition of the locos with many in "super shine" still cherished by their regular crews. Some of the class 25NCs had names with gleaming copper and brass fittings. This was not a steam fleet in its final days of life! The coal stage was another surprise with large bunkers storing the coal. Wagons of coal were propelled up a steep ramp onto the stage by a class 19D 4-8-2 and once in place the coal was discharged into the hoppers below. This was a very dramatic scene and I watched as the bunkers were topped up ready for the working week ahead. Spending over three hours on the depot was easy and I got through many rolls of slide film recording the scene as if it were going to disappear the next day. Thankfully this was not the case and during this trip other depots (Port Elizabeth, De Aar, Kimberley, Germiston etc.) showed that steam was still very much part of the agenda on South African Railways. Over the years I made many return visits to Bloemfontein shed and as might be expected the numbers of active locos slowly declined as the scrap line gradually extended.